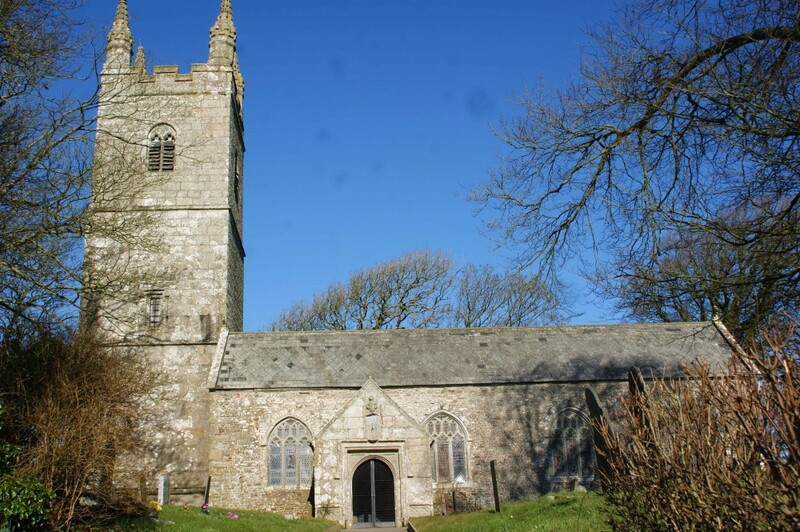 The parish of Bridgerule lies on the extreme edge of Devon, with majority of the residents of the village living on the “Cornish side” of the River Tamar, which runs through the village. Bridgerule was mentioned (as Brige) in the Domesday Book in 1086, when the local manor was held by a Norman, Ruald Adobed. The name, Bridgerule, is thought to come from bridge and Ruald. St Bridget’s Church is grade 1 listed. It stands in an elevated position in open countryside on the edge of the village of Bridgerule and forms a prominent landmark. The only survivals of the Norman Church are the simple font and stoup, now in the porch. The earliest parts of the present church are the C13 chancel and north transept, now the Lady Chapel, with a C13 arch to the nave. The nave was enlarged in mid C14. One C14 window opening remains, in the north wall. The south transept was enlarged in the C15, as a 5-bay south aisle with granite piers. On the south wall are four 3-light perpendicular windows. The C15 wagon roofs remain, with bosses and angels on the wall plate. The C15 south porch retains its original timber roof within, with carved beams, bosses and wall plates. Above the south porch is an image, and in the niche is a sundial, c1800. The west tower was built in the mid C15. It is of 3 stages, embattled with pinnacles. The five bells date from the C18. Of the C19 restorations, the first was undertaken in 1878 by J.P. St Aubyn. The vestry was added to the north east, and slate floors were laid. The rood screen, baptistery screen and reredos date from the late C19. Two pieces of medieval glass were incorporated in the east window of the aisle. In the church is one C17 slate memorial. The principal slate memorials inside the church are to the Kingdon family. Father Frank Hawker Kingdon was part of a long line of members of the Kingdon family to take the incumbency of Bridgerule. Members of the family have also been incumbent at other local churches including Whitstone and Pyworthy. Father Kingdon is best remembered as one of the longest serving incumbents of the Church of England, serving Bridgerule for 70 years, becoming Vicar in 1888 and dying in office in 1958 at the age of 98. The electoral roll of St Bridget’s includes 28 people. The church has strong links with the church school in the parish and with the local residential home for the elderly. The church has maintained a lively programme of services and activities throughout the year and the P.C.C are keen to encourage community engagement in church life. There is a set pattern of weekly Sunday services beginning at 11.15am. Eucharist is celebrated twice a month, with a Morning Prayer service usually on the second Sunday each month. A popular family service is held on the fourth Sunday, making use of the church’s PA system and data projector.